A COMIC BOOK LEGAL DEFENSE FUND BENEFIT BOOK! "USED YOUR IMAGINATION LATELY?" Calling all dreamers and dancers, wanderers and wonderers, free speakers and free thinkers to this year's CBLDF LIBERTY ANNUAL, compiled by former Marvel editor and ardent imaginaut LAUREN SANKOVITCH. Within the pages of this year's Annual, a merry band of legendary creators has crafted 48 PAGES of THRILLING ADVENTURE, POWERFUL DRAMA, and GUT-BUSTING HILARITY that is not only ALL-NEW but ALL AGES! So grab your favorite life forms and gather ‘round for a series of tales to test the bounds of your imagination and celebrate our freedom to do so! 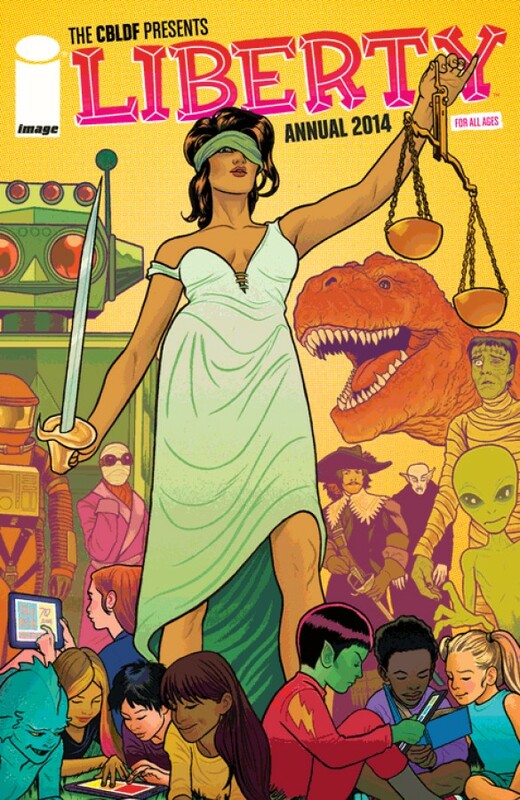 All proceeds from this book benefit the important First Amendment work of the COMIC BOOK LEGAL DEFENSE FUND, who've been fighting censorship in comics for over 25 years!